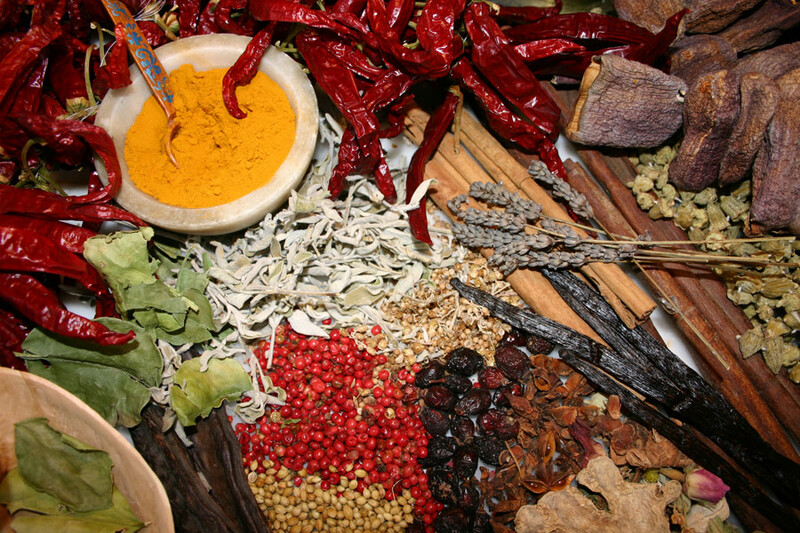 The story of spices is a fascinating one of great voyages, exploration, conquests and colonization. 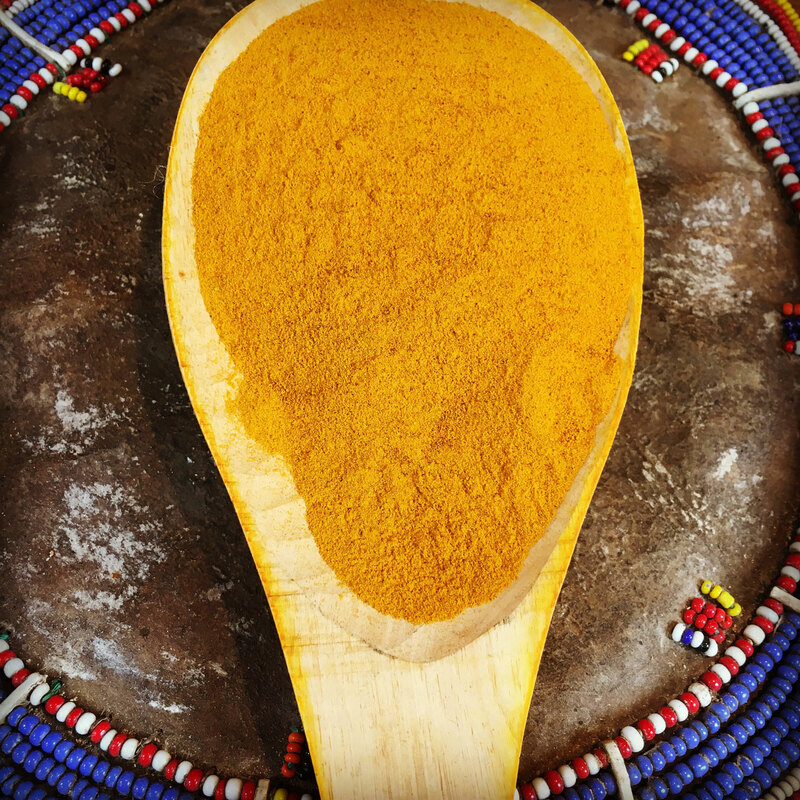 The ancient trade routes by land and by sea carved up the culinary world from China and Southeast Asia to India, Africa, the Middle East and Europe, introducing cinnamon to our baking, vanilla to our puddings, and black pepper and salt to the common table. Chillies, on the other hand, came later and took a slightly different route from the New World and at a later date in history, but they have been so effectively absorbed into the cooking of many different cultures, you would think they had always been there. 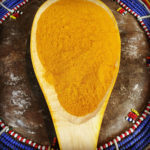 My interest in spices is not solely related to food – their medicinal and cultural uses are just as important – and, for over 30 years, I have researched and written about them and how they are used in different cultures. I have been dubbed ‘the original spice girl’ by Scotland on Sunday and I regularly talk about the origins and uses of spices on Radio Scotland’s Kitchen Café but, at home in my kitchen, I love bringing them to life – roasting and pounding, dreaming of journeys through India, Southeast Asia, Turkey, the Middle East and Africa – the warming aromas and flavours transporting me from busy street markets to sundowners in the bush. Happy memories, wanderlust and nostalgia! 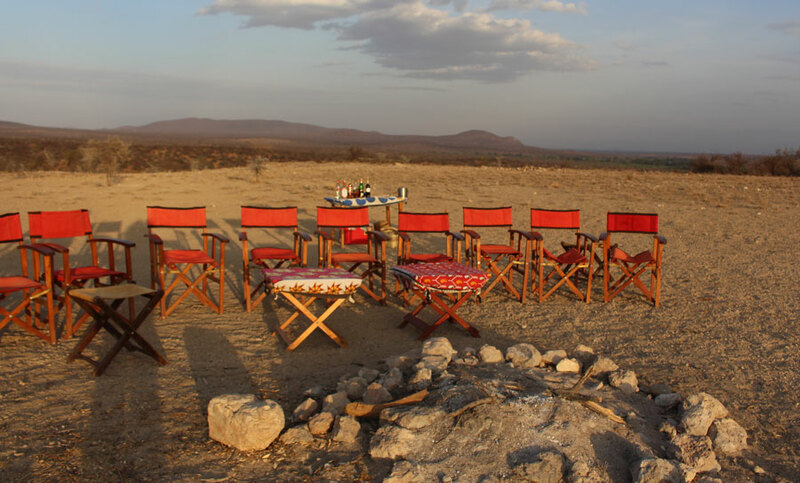 Like a true hermit, it’s not often I come out of my shell and do some live cooking – although I have an inkling it is going to become a ‘thing’ in the future – but the persuasive powers of the charming and creative ‘froglady’ chef, Lydie Bocquillon, www.auld-alliance.com, the director of Food on Film, www.kingussiefoodonfilm.co.uk, and the urgency of the charity CRY (Cardiac Risk in the Young) forced me to come out from the hills to participate in a cook-off with Chris Trotter, www.fifefoodambassador.co.uk, the legendary chef and Food Ambassador for Fife (probably Scotland too!) and, amazingly, with my extremely laidback Singapore Laksa, I won! It was all a bit of good fun and could have gone either way but the point was that the winner would contribute the fee to a local charity so I donated mine to CRY – Chris would have done the same! It was a great event with a superb turnout of Scottish food producers, some of whom I will revisit in the future when broadcasting, but I also managed to sell all my jars of harissa. To be honest, there is nothing quite like the homemade stuff – it is oily and fruity, aromatic with roasted spices and tinged with a spark of chilli heat – a little goes a long, long way, making it a versatile, economical and utterly delectable spice paste. 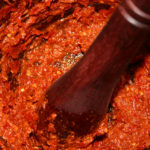 So, here I am giving you the secrets to a successful harissa – please keep them to yourselves! Place the chillies in a bowl and pour over boiling water to cover them. Leave them to soak for at least 2 days – generally I soak for 4 days – changing the water every day. Drain the chillies, chop off the stalks, and squeeze out the water and most of the seeds. Discard the stalks and seeds, and coarsely chop the chillies. Using a mortar and pestle, pound the chillies with the garlic and salt to form a thick, smooth paste – this takes some time but it is well worth the effort. Dry roast the cumin and coriander seeds and grind them to a powder. Beat in the ground spices and add roughly 2 tablespoons of the oil so that the paste is thick and moist. To this base paste, you can add fresh or dried herbs, other spices, and chopped orange or lemon peel but I prefer to stick to the traditional method and add the other ingredients to each dish I use it in. 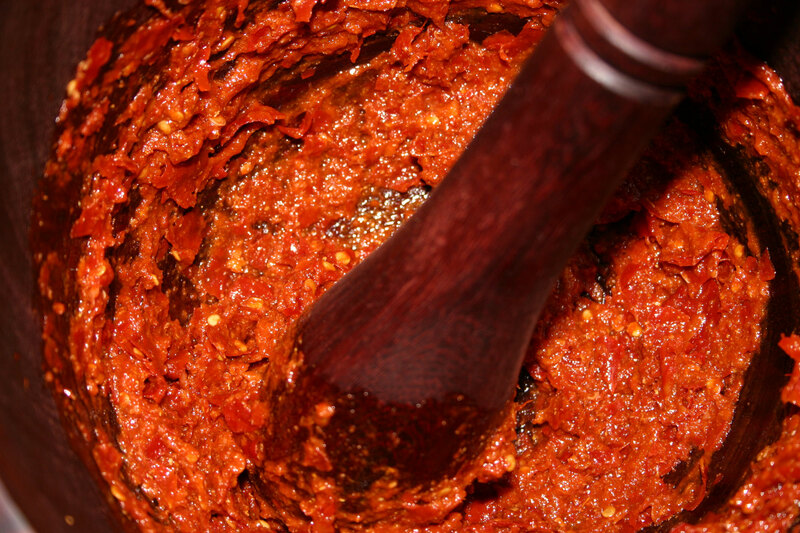 Spoon the harissa into a sterilized jar and cover with a thin layer of oil to keep it moist. Seal the jar and store it in a cool place, or in the refrigerator, for 1-2 months. Just use a little when you need it and top up the layer of oil when you seal the jar again. 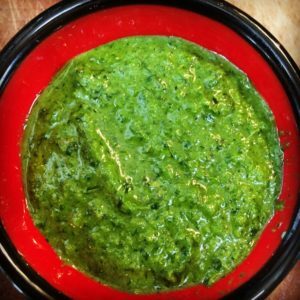 What can you do with harissa? It can be used as a condiment with grilled or roasted poultry, meat or fish, or with simple things like fried or boiled eggs; it can be stirred into oil and used as a marinade or dressing; or added to yogurt, cream cheese, and pureed vegetables or chickpeas to make a tasty dip; and it can be used as the base flavouring in any type of soup, stew or grain dish. Basically, this wonderful stuff enhances almost any dish with its depth of flavour as well as its chilli kick! Enter your email below and get an email every time Ghillie's blogs are updated.